Lately, we have been watching documentaries which are super informative and could convince a meat-eat person (like me) to start thinking vegetarian. 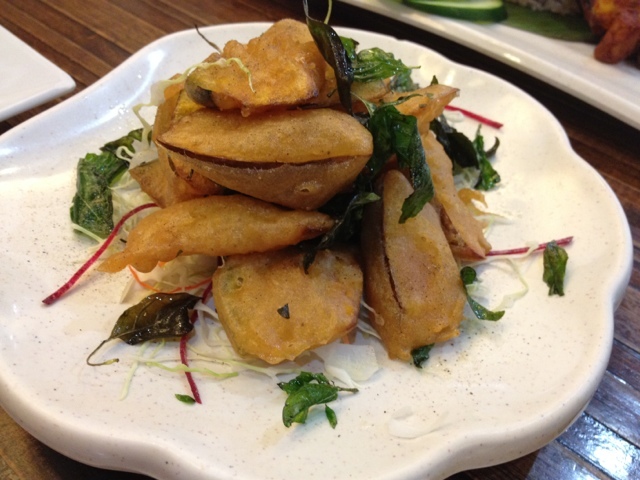 That is why I have been on the hunt for good vegetarian food places. 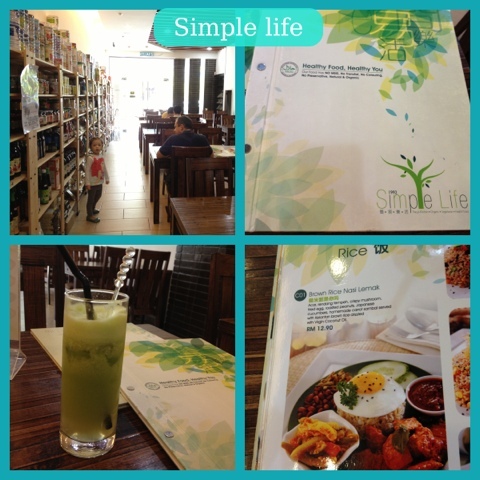 Near our place, I discovered that they have one of the branches of Simple Life. We went on a Saturday lunch time, arriving around 11am. I wasn't sure if they were open because when I got there, their signage said "closed", however I already saw a table with 2 people eating. I guess they forgot to put the "open" sign. We went in and ordered. The food took a while to come out, and we were very hungry. At this point, I think whatever they served out will taste good to us because of our hunger. You see, we have been doing "juice" breakfast for the past week, and hubby was on his 6th day of Juice Fast. I will write a separate article about the juice fasting (and the benefits of it) on a separate blog post. One main difference with Woods Microbiotics is that this place was more spacious, had more tables and more welcoming. In terms of food, foodies who are into pure organic will appreciate Woods more because they are fully organic, while Simple Life is more of vegetarian -- not really focusing much on organic. They do sell some organic stuff in the store, mostly finished goods, many vegetarian stuff from Taiwan. 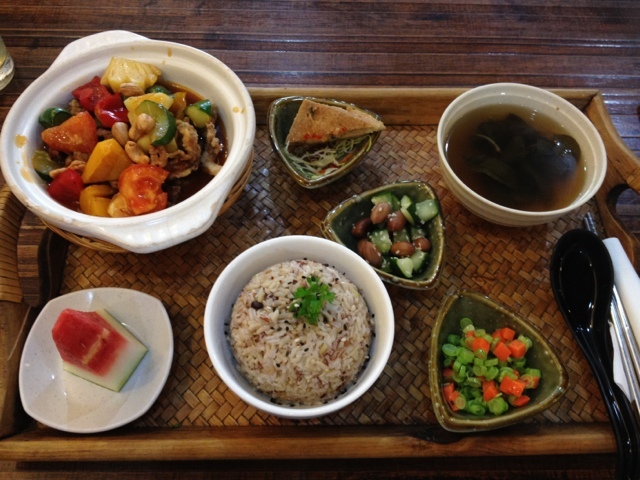 My set meal, which was a mushroom sweet and sour set, was pretty good. No regrets. 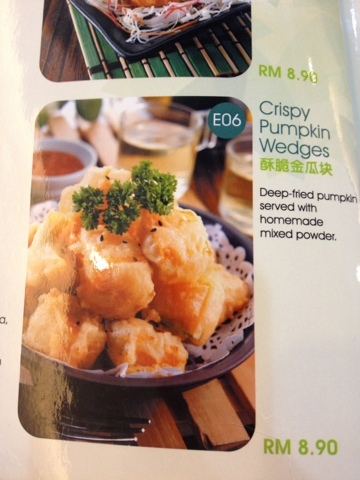 We also ordered some a la carte stuff, like this fried pumpkin. My daughter initially thought it was chicken nuggets and dug into one. However she didn't finish it. We did enjoy it though. 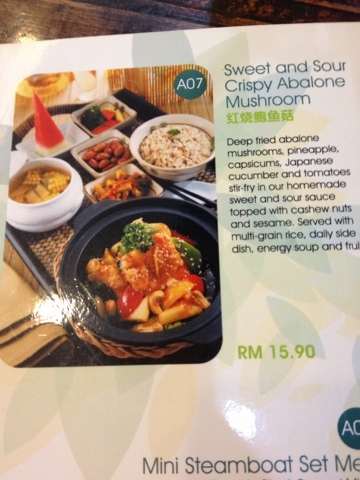 Tasty, especially when I dipped it into my sweet and sour sauce (from the set meal). It came also with some basil leaf. My husband ordered a veggie fried rice which had basil leaves. It was tasty in itself and portion quite generous. It was topped with some shredded cabbage. 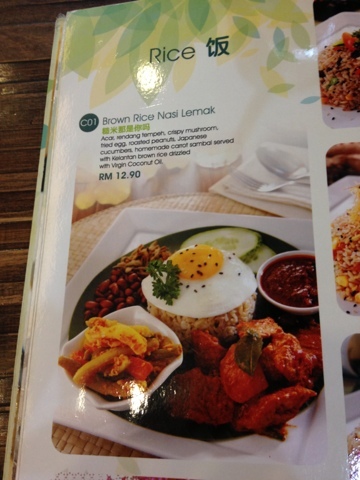 Then, I ordered a dish "Nasi Lemak", which is of course vegetarian. This one was for my maid and she couldn't finish the whole thing. Quite a generous portion. 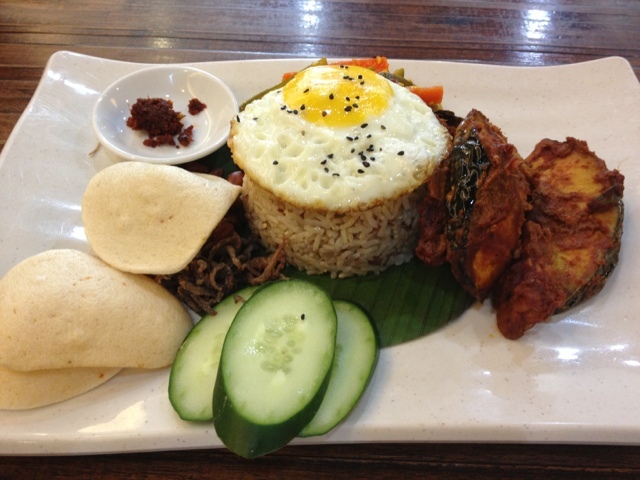 The "meat" part was composed of some tempe and some pumpkin, which had some nasi lemak sauce taste. 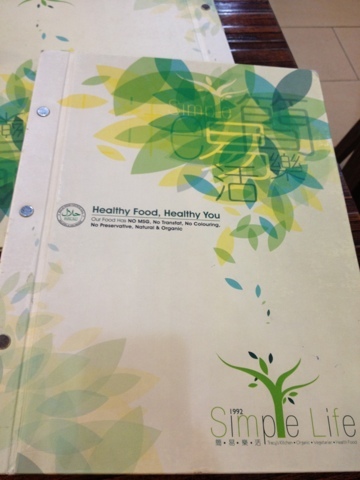 The menu had many nice pictures which can help you choose your vegetarian meal. I noted that the prices are much lower than Woods Microbiotics, as well as compared to my recent trip to Eco Green (TTDI branch). This main difference the organic factor -- organic stuff cost higher, hence higher meal prices. 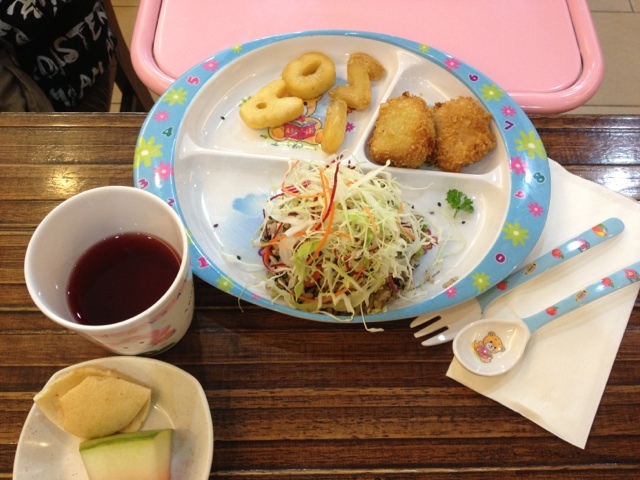 For my daughter, we ordered the children set meal which came with a drink, some alphabet-looking fries and "chicken nuggets" which were in fact made of tofu. My daughter ate the rice and the nuggets, and a piece of the alphabet fries. Was quite surprised she also tried some of the raw cabbage! The overall experience was not bad. The price is also very reasonable, especially if vegetarian people plan to eat there often. I did a take-away of a Mushroom Seasoning which is from Taiwan. 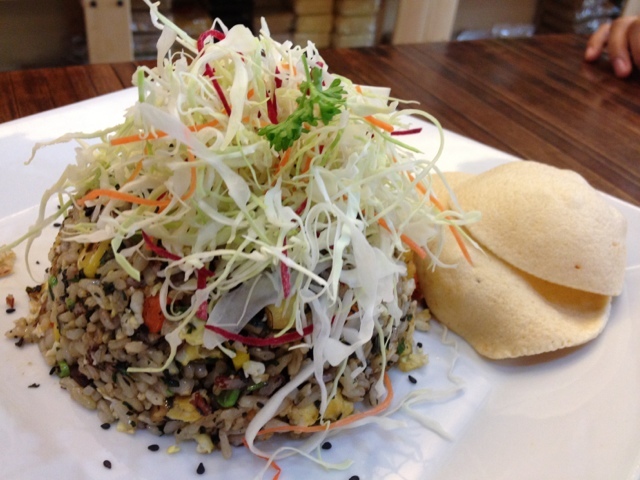 This is something you can add when you cook vegetarian dishes, to enhance taste naturally. 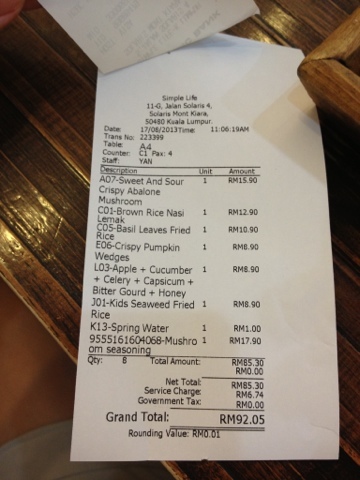 Total bill for 3 adults and 1 toddler was Rm92 inclusive of the take-away seasoning.